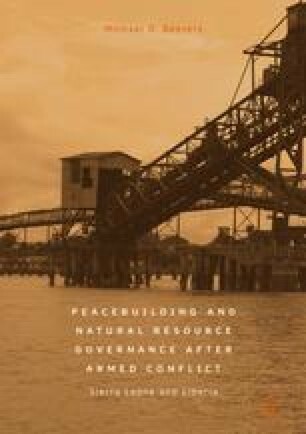 To better understand how natural resources contributed to the conflict in Liberia, Beevers provides an in-depth history of the country from its settlement in 1822 to the civil war a century and a half later. The chapter draws attention to the changing political, economic and social dynamics of the state and explains how the control of land and natural resources lie at the heart of the Liberian history. Beevers then explores the Liberian civil war in detail, and documents the emergence of natural resources, and specifically the exploitation and trade in the so-called conflict timber, as a dominant cause of the conflict. PBS Frontline. 2015. Firestone and the Warlord. https://www.pbs.org/wgbh/frontline/film/firestone-and-the-warlord/.